Alien 9 Collectibles aka "Look what I found!" I found these here, while I was actually looking for a flater scan of the book cover that Sai has posted above (the one of the party). I have an extreme urge to make a wallpaper out of that. If anybody knows where I can find one, please point me in the right direction! 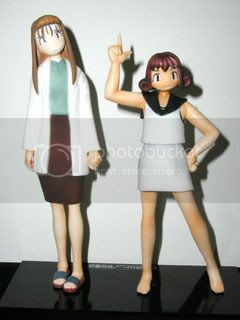 (back to normal now...) I was really suprised to find a figure set of Megumi and Miyu. I also love the posed that Yuri, Kumi, and Kasumi are in! Kasumi and Kumi especially look awsome, while Megumi just looks plain dazed and confused! Tua Mater vertus est ut linguam Latinam loquatur! Ahhh awesome!!! I waaaant them! The faces could be a bit better but I totally agree with you on the poses, very dynamic. And its great that theres ones of Megumi and Miyu who get overlooked. Does the text on that page come up garbled for you? I guess they may of used a special font or something, as I have Japanese Language installed on my computer etc. but its still messy. Shame because I'd like to translate the page to find out more info. 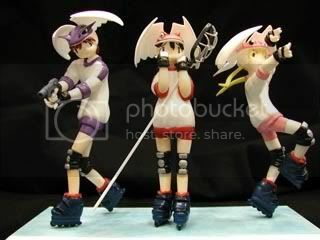 But I suspect they're from WonderFest 2002, which is an annual toy/figure show in Japan during winter. At that show theres a mix of stuff for sale or show ranging from official products to stuff produced by anime fans who are hobby model makers. In that case I fear it was probably another limited release just for the event made by a fan. Shame as they do look cool. 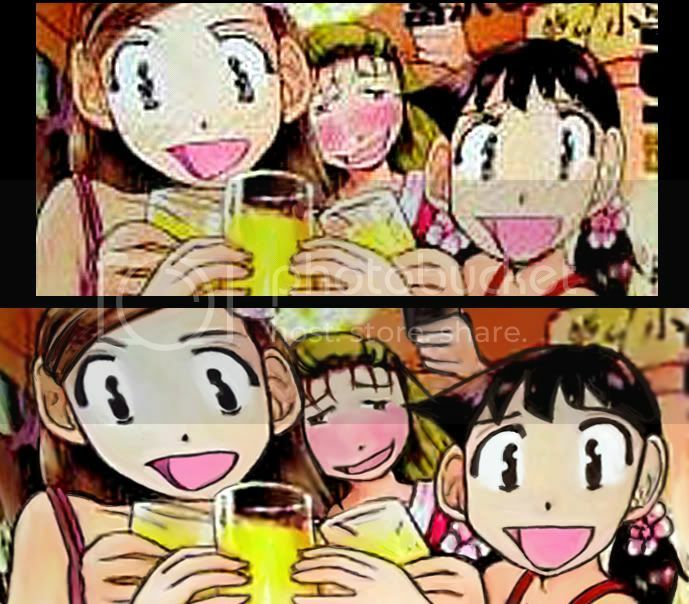 Oh and not sure if you know but I found if you click on the images you get bigger versions and if you click again on the bigger version of Miyu/Megumi you get a version of Miyu in a swimsuit. As to the book thing. Yeah it would be nice if it was flatter, your best bet is keeping an eye on Yahoo Auctions Japan for another auction of the same book to come out with a better image. I could maybe fix up something in Photoshop though but will take some time and won't look as good as if it were originally a larger and flatter image. I'll give it a whirl sometime though. Here you go, this is what I could do. Sorry its not the whole image but it wouldn't of fit within a computer screen's dimensions since the original image is so long. I had to stretch it up quite a bit and the image was very low quality so it looked quite a mess but I went over it all with various brushes and tools and even redrew various sections. Its still quite scrappy in places but I hope it fits what you wanted. Last edited by Sai on Mon Jun 02, 2008 2:38 pm, edited 2 times in total. Thanks! I'll make sure to post the wallpaper up under the misc computer scetion when I'm done with it!! So, I found a small Alien Nine poster on eBay and purchased it. It's now on my wall, and I can take a picture if anyone's interested. It was the only A9 poster I could find. Sure, it'd be interesting what the image is of, if you're able to post it. Post subject: Re: Alien 9 Collectibles aka "Look what I found!" Stuffs of alien-9 characters are looking cool and funny. Specially, Otani yuri is looking great and fabulous in flying hat. Alien-9 is popular manga series of Japan and their anime version is also awesome. I never saw these photos previously. Cool. Hard to find out about stuff they released for this series when it comes to merch.